>> [Photo Credit: Lemon Photography] Late last year a friendly label rep turned us on to the Eros And The Eschaton, a North Carolina-based couple making serene dream pop presented in some charming video clips like this arresting one for "You Know I Do," and this one for "Lately (I've Been Wondering"). 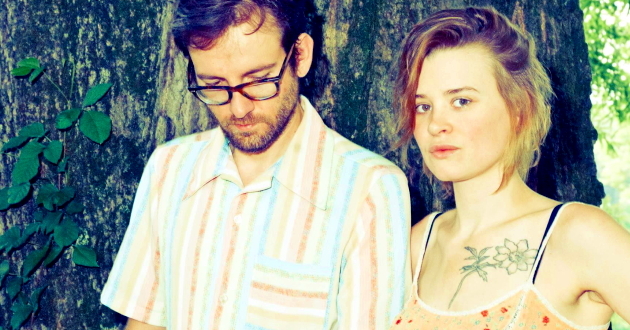 Fast-forward to earlier this month and, lo and behold, it was announced that the duo -- Kate Perdoni and Adam Hawkins, who met in Omaha but settled in Greensboro when their van broke down in the central Carolina city -- have now signed to the above-referenced label. And so Eros And The Eschaton's full-length debut Home Address For Civil War will be issued by Bar/None Aug. 13. The bigger surprise is the huge, bold sound of the record's preview single "Heaven Inside." A calm center remains, in the form of the duo's airy vocal harmonies, but the remarkably dense musical accompaniment eschews the subdued sound of the band's self-released, 2012 singles and instead throbs with energy while a vast wall of melodic guitar and white-out percussion smear across the fore of the stereo field. The result is one of the most stirring shoegaze tracks of 2013, just the kind of thing Clicky Clicky is always on the look-out for. Eros And The Eschaton are supporting the 10-track release with a substantial tour in September including an appearance at the annual Hopscotch confabulation in Raleigh, but as of yet there is no date for the duo's live return to the Boston area (its area debut was at Precinct in late spring). To whet your appetite for the release, we've embedded the thriller "Heaven Inside" for your listening pleasure below; pre-order Home Address For Civil War from Bar/None right here. >> It's been a surprisingly long time since we were last rocked by the fresh-faced indie pop of Amity Beach, whose late 2011 digital single knocked our socks off. The Ontario-based quintet returned at long last this month with pop gold in the form of a new digital single, "Sunday Nights To Infinity" b/w "Avalanches." The pair of songs, released via Bandcamp June 10, are taken from the act's planned debut long-player Bonfire Etiquette. Both tunes are driven by bright, tight guitars. Fizzing tempos push melodies across deft arrangements in a manner that recalls the remarkable pop of veteran Delaware indie pop heroes Spinto Band. "Sunday Nights To Infinity" overflows with lyrics bursting with romantic optimism and nostalgia underscored by tinkling piano embellishments. "Avalanches" runs with a similarly irresistible formula, but is notable for bright horns bolstering the soaring chorus. We can't find a release date for Bonfire Etiquette, and it would be a shame if it were not released in time for the set to be a go-to summer jam that this intoxicating single suggests it will be. Then again, that slightest of bites of nostalgia and loss in "Sunday Nights To Infinity" and "Avalanches" may be even more potent once summer begins to fade. Stream both tunes via the embed below, and keep an eye on Clicky Clicky for news about Bonfire Etiquette. >>So maybe you live under a rock, or just have a terrible memory, and so you aren't aware of the excellent second preview single from Weekend's forthcoming long-player, a song called "It's Alright." Well, we've embedded it below along with the new album's killer lead track "Mirror," because you need to be up-to-speed on the latest, greatest thing from Slumberland, a label that has been just on fire these last couple of years. "It's Alright" is taken from Weekend's Jinx, which will be issued July 23, and the tune in its earliest moments sounds like a brilliant The Cure outtake circa 1983's "The Walk" 12". However, it is fronter Shaun Durkan's booming but gentle vocals, the song's Keith Levene-styled guitar playing and a big swinging beat that dominate the tune. Pre-order Jinx from Slumberland now on 45RPM, colored-media double 12" or CD. The now Brooklyn-based post-punk foursome play at Church in Boston Oct. 23, and you can bet that's gonna sell out faster than you can say, well, just about anything.